The internet is a great source of inspiration for me, as is for anyone, of course. Yet, inspiration can be found anywhere. Nature—God’s gift to us—is beautiful and therefore ever inspirational. Especially now, with the short and dark days gone, shrubs bursting with new life, the air gentler than long and smelling like spring, I myself feel like I am waking up from an hibernation. Visiting a local easter market, I found myself inspired to haul out my easter decorations and prepare my flat for the upcoming holidays. 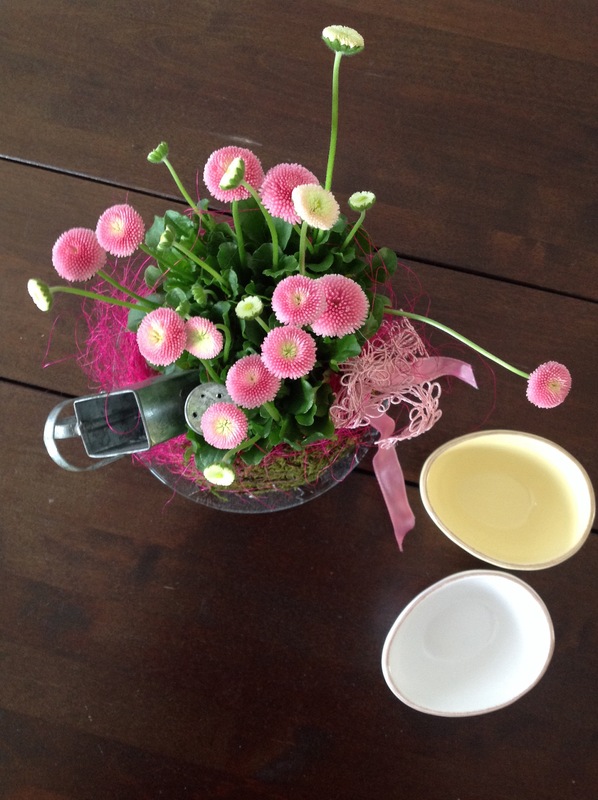 Every year, my mom buys me an easter egg, bearing the year date. To purfle eggs like this has a very long tradition. The ornaments are old, as is the technique. I know of two techniques coming to the same result. One is to dye the egg and then to scrape off the colour again with a very sharp knife. 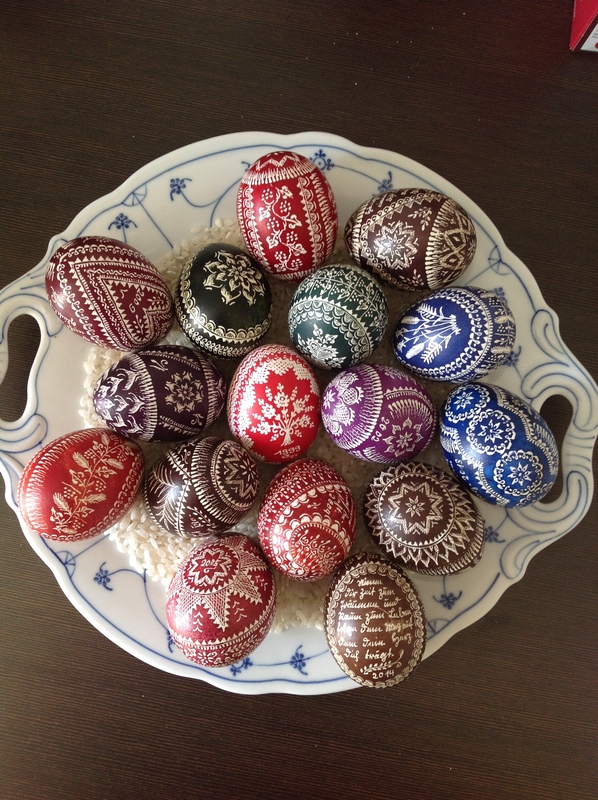 My eggs, however, are done the other way round: the ornaments are brought on in form of melted wax, then dyed in cold colour, and after that, the wax is melted away so that the eggshell is visible where the wax has been. Every one of my sixteen eggs so far, has a little verse or saying which the 86 year old lady who makes these works of art writes in old German letters. Fortunately, my grandmother taught me to read these characters as a child. But the lovely old lady always reads the inscription out aloud for me when we buy the egg. They are not blown, by the way, but raw and heavy. One would think they would begin to smell but they do not, of course. They dry very, very slowly over the years until they get as light as a blown egg at last. 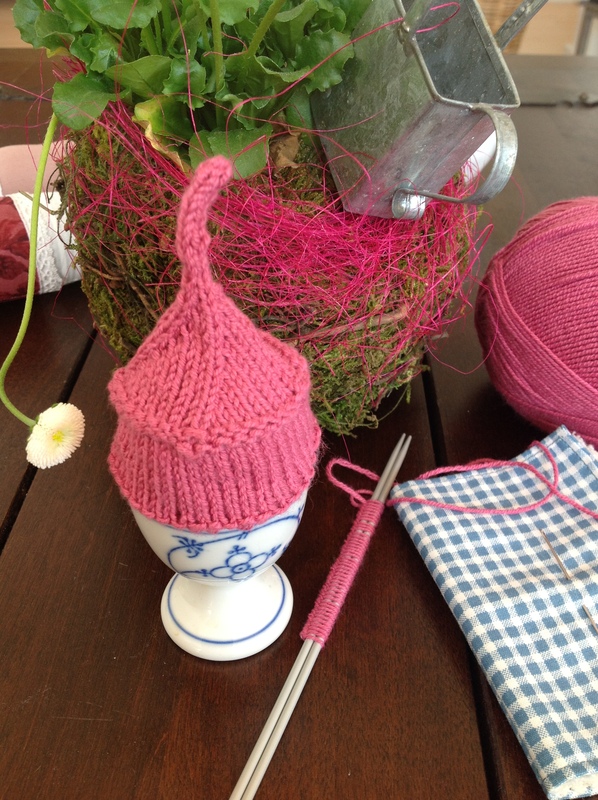 Lately, I saw a knitted egg cosy on the internet and tried my version of it. What a cute little easter present this will make. Posted in Uncategorized and tagged easter, egg, egg cosy, flower, knit, shrub, spring. Bookmark the permalink.